Test Your Body Fat Level at Home! Accu-Measure's body fat calipers accurately and reliably measure your body fat level in the privacy of your own home. This convenient and reusable device is an indispensable tool for monitoring the progress of any diet. If you seriously want to get in better shape, you need to monitor your body fat levels on a regular basis. Most fitness centers will perform a body fat test for you, but these tests are always inconvenient, and often expensive. You can purchase the Accu-Measure for less than the cost of a single health club test, and use it whenever you want, without inconvenience or embarrassment. 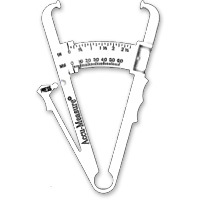 It's the only body fat caliper that can be used accurately without the assistance of another person. Accuracy, reliability, and low cost make the Accu-Measure the best body fat tester on the market. The Accu-Measure is extremely easy to use. You simply grasp a section of your skin near the top of your hip bone, holding it between the thumb and forefinger of one hand, and gently squeeze the Accu-Measure over that skinfold with your other hand, until you hear an audible "click". A sliding marker on the Accu-Measure will indicate the exact thickness of your skinfold in millimeters. By matching this measurement to Accu-Measure's included body fat chart, you'll instantly know your percentage body fat. Dieting may seem like the obvious solution for ridding your body of excess weight, but improper dieting can leave your body even fatter than before. How is this possible? The weight that you lose when dieting is always a combination of fat and lean tissue (i.e. muscle). If you make subtle changes in your eating habits and get plenty of exercise, it's likely that a greater percentage of your loss will be from excess fat. However, if you diet too rapidly, a larger portion of your loss will come from lost muscle. Not only is muscle important to your body for controlling movement, but it's also metabolically more active than fat. As you lose muscle tissue, your metabolism slows down, making fat loss more difficult. And if you return to your previous eating habits, you'll gain back that excess fat even faster than before. Your bathroom scale can't tell the difference between lost fat and lost muscle, but the Accu-Measure can. By measuring your fat loss rather than just your weight loss, you'll have the feedback you need to keep your diet on track. In this test, you are suspended in a sling above a pool of water. After expelling all of the air from your lungs, you are lowered beneath the surface of the water, and your weight is recorded. The ratio of your weight in and out of the water is used to determine your body's overall density and body fat percentage. In this test, electrodes are connected to various parts of your body (usually your hands and/or feet), and a small electric current is applied. A measurement is taken to determine your body's resistance to that electrical current, and that measurement is converted to an approximate body fat percentage. In this test, the thickness of your subcutaneous (under the skin) fat is measured at specific locations on your body, using special skinfold calipers. Different formulas are then used to determine body fat levels from those measurements. While underwater weighing is generally believed to be the most accurate method for body fat measurement, it's an inconvenient and time-consuming test to perform. This makes it a less desirable method for regularly measuring your body fat. Electrical impedance testing is an easy test to perform, but requires equipment that is more expensive and sophisticated than other testing methods. In addition, many variables, including differences in the hydration level of your skin, can adversely effect this test's accuracy and reliability. Skinfold measurement methods correlate well with underwater weighing, and use much more convenient tools. The only drawback to skinfold measurement used to be that it took a reasonably skilled practitioner to perform this test. Accu-Measure overcame this challenge by developing a simpler, single-site measurement technique, and by creating a set of calipers that automatically applies the correct amount of pressure to the measurement area. Self-testing of percentage body fat with the Accu-Measure was as accurate as results from multi-site measurements and calculations taken by an experienced clinical investigator using a Lange caliper. Percentage body fat calculations with the Accu-Measure were within 1.1 percentage points of underwater weighing results, the gold standard of body fat measurement. Better Fitness Products no longer sells Accu-Measure, but you can Buy them Here .